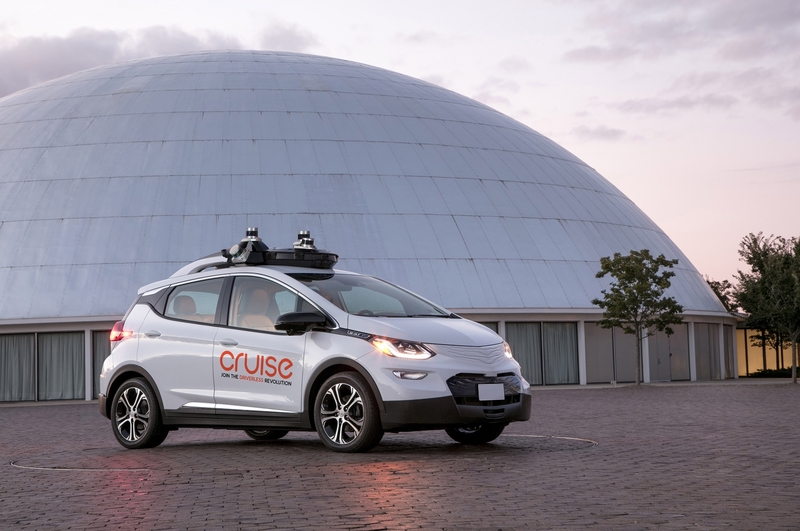 Enlarge / GM’s Cruise subsidiary recently acquired Strobe, a company that seems to be developing a lidar sensor based on continuous-wave frequency modulation technology. A third design choice facing companies developing next-generation lidars is how to measure the time—and therefore the distance—it takes a laser beam to reach its target and bounce back. Most lidars today use a straightforward time-of-flight approach. They transmit a very short pulse and then use a super-accurate clock to measure how long it takes for the pulse to bounce back. Some companies are working on a more complex approach called continuous-wave frequency modulation. As the name suggests, this approach sends a continuous laser beam out to a target. This light is split into two beams, with one beam traveling to the target and bouncing back, where it’s recombined with the other beam. The original beam has a steadily increasing frequency, and the two beams travel different distances, so when they’re recombined they have different frequencies. This produces an interference pattern with a beat frequency that depends on how far the first beam traveled. CWFM lidar sensors “are pretty much totally immune to background light,” says Paul Suni, a researcher at Lockheed Martin who has worked on the technology. A conventional time-of-flight lidar can get confused if there are other light sources transmitting at the same frequency. A CWFM system is more nimble, and Suni says it can continue functioning even in the face of glare from the Sun. This will be particularly important in a future where every car has several lidar sensors. With so many lasers bouncing around, it would be easy for conventional time-of-flight lidar sensors to get confused. To distinguish the two, Suni says, CWFM lidars use an “upchirp followed by a downchirp.” Measuring first with a rising frequency and then with a falling one reverses the sign of the distance-frequency relationship, while the velocity-frequency relationship is the same for both measurements. Then it’s a simple matter of algebra to figure out both distance and velocity simultaneously. That seems to be the approach taken by the lidar startup Aeda, which was recently covered by The New York Times. It may also be the approach of Strobe, a lidar startup that was recently acquired by General Motors. 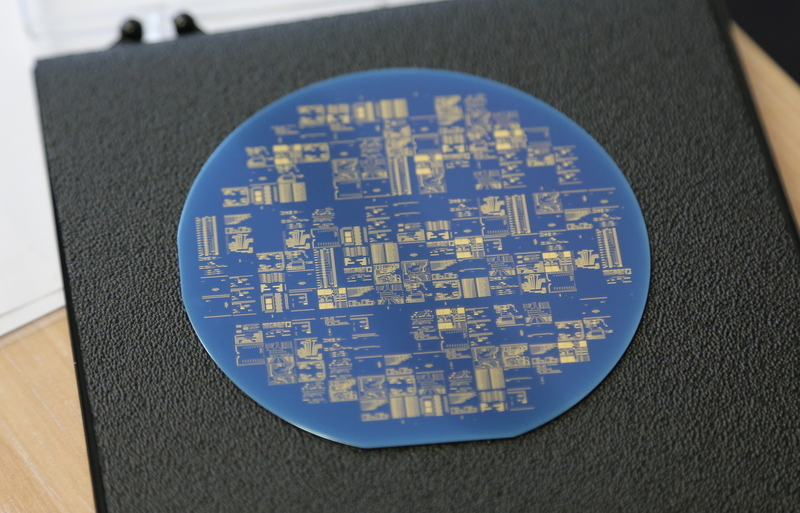 Enlarge / An indium phosphide wafer contains photonic integrated circuits. Scientists are developing the capability to fit all the components of a lidar sensor onto a single chip. Companies are experimenting with a lot of different designs for next-generation lidar, and experts we talked to couldn’t say which of these designs would be successful. But everyone we talked to was confident we’d see substantial price declines in the next few years. Experts told us there are a lot of historical examples where previously expensive hardware became affordable—and then downright cheap—as it was manufactured at larger and larger volumes. Lidow points to the falling cost of anti-lock braking systems, which automatically pump the brakes to prevent skidding, as a model. “I started working with GM on this concept in 1979,” Lidow said. Early versions of the technology cost $2,000 per wheel. That was far too expensive for the consumer market, but it was well within the budgets of airlines. As the price came down, trucking companies started putting them on 18-wheelers. Today, Lidow said, ABS hardware costs around $5 per wheel. Lidow predicts that in the long run, lidar sensors could cost as little as $10 each. Carnegie Mellon’s Singh also sees big price drops ahead. “In the early going, when calculators first came out, they were $1,000 each,” Singh told Ars. “Then we started building millions of them.” Companies figured out how to fit all of the necessary electronics onto a single chip, and costs plunged. A number of researchers, including some sponsored by DARPA, are working on techniques for squeezing all the components for a lidar sensor onto a single chip. They’ve been able to draw on innovations pioneered in the communications market, because fiber optic chipmakers are trying to solve a similar problem. Needless to say, they haven’t started producing the chips in volumes of millions of units per year, and it’s going to take a lot of work to reach that milestone. And Abuelsamid, the Navigant analyst, warned that it might take time for the promising advances in the lab to make their way into consumer products. Beyond those scaling challenges, solid-state lidar units have another big disadvantage: their field of view is limited. This means that it will take between six and twelve solid-state lidar sensors to replicate the 360-degree visibility achieved by a single spinning rooftop lidar. So even if spinning mechanical lidar is more expensive per unit, mechanical lidars could still be more affordable overall if one mechanical lidar can replace several solid state units. Most of the experts we talked to viewed solid-state lidar as the future. But Lidow told Ars that we shouldn’t count spinning mechanical lidar sensors out yet. “A spinning disk is not expensive,” he said. After all, there are plenty of spinning mechanical components in a car that last for hundreds of thousands of miles—and they cost a lot less than today’s lidar units. The bottom line is that while bringing lidar costs down will take a significant amount of difficult engineering work, there don’t seem to be any fundamental barriers to bringing the cost of high-quality lidar down below $1,000—and eventually below $100. That means the technology—and ultimately, self-driving vehicles that depend on lidar—should be well within reach for ordinary consumers. For years, pundits have touted cost as a major barrier to mainstream adoption of self-driving cars, with a $75,000 Velodyne lidar as the most expensive item on the equipment list. But this fundamentally misunderstands the situation. Experimental, low-volume hardware for cutting-edge technology is almost always expensive. It’s through the process of mass manufacturing and iterative improvement that companies learn to make it cheaper. Right now, lidar technology is at the very beginning of that curve—where antilock brakes were in the early 1980s. There’s now a massive amount of venture capital being invested in making better, cheaper lidar units. It’s impossible to predict whether it will take five, 10, or 15 years to bring the cost down from thousands to tens of dollars. But there’s no reason to think lidar sensors are different from other technologies that started out expensive but steadily got cheaper and better over time.